Can you believe we have been doing these Weekly Meal Plans for 40 weeks? I love knowing that we can find meals to make during the week that are easy and yet deliver plenty of smiles. I guess it always helps to have a dessert that can last all 7 days….if you are use lots of discipline. 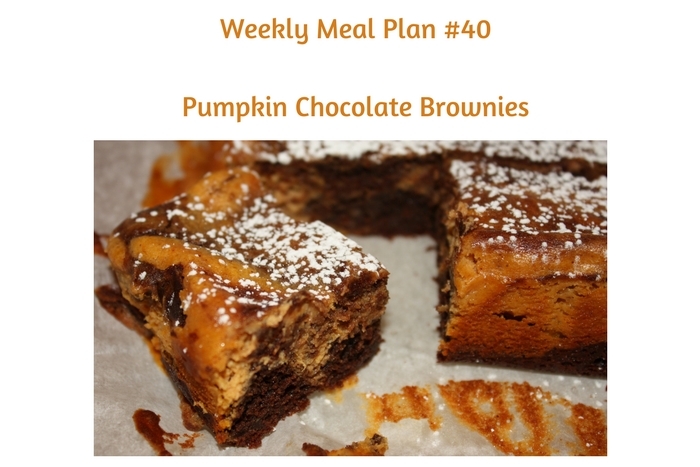 This week’s Pumpkin Chocolate Brownies will definitely hit the spot. Be sure to check out the adorable soup holders that Erica used for her Pumpkin Beer Cheese Soup. Slow Cooker Honey BBQ Meatballs, One Pot Cheesy Smoked Sausage Pasta, Chicken Tacos and Parmesan Crusted Pork Chops will all bring comfort to your evenings. Time to get busy with Weekly Meal Plan #40! Meatless Mondays are perfect for this Pumpkin Beer Cheese Soup from The Crumby Kitchen – Quick & easy, and a super cheesy way to start your weeknight dinner menu. I don’t think I have ever seen more people flip over a brownie than I did this one. I got a request to make them a second time, only 5 days later, True confessions: I don’t happen to like Pumpkin, so I never got to taste them. But, seeing the reaction of everyone eating not just one but three and four at a time was all that I had to see to know that I will continue to treat others to them. This makes me so happy to see. I appreciate that you made a recipe that included a key ingredient you do not like!